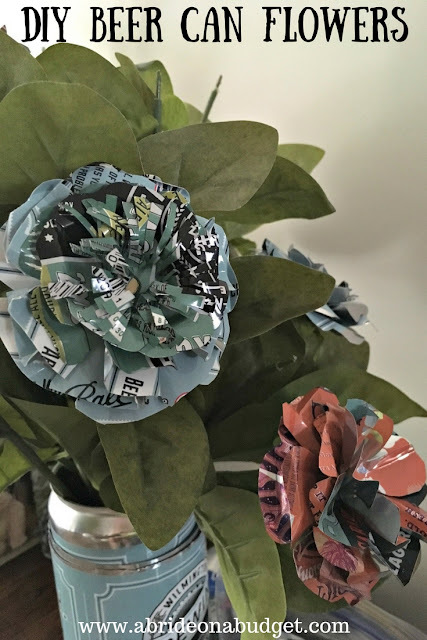 My friend's daughter is getting married at a brewery later this year, and she is making DIY beer can flowers to use for the centerpieces. I got a chance to help my friend make them recently, so of course, I took photos as often as I could to put together this tutorial. It takes a can and a half per flower, so definitely keep that in mind when you're buying beer. Also keep in mind that a thinner can is a lot easier to work with than a thicker can. And the design on the can really makes the flower. So maybe you have a favorite beer, but you might have to change it in order to get flowers that match your wedding colors. Carefully cut off the top of the can. Then, cut down the side of the can, and cut off the bottom of the can. Flatten it (my friend uses her granite counter top). Trace one of your three circle temp on to the can and cut it out. For each flower, you will need two 2.5 inch circles, one 3 inch circle, and one 5 inch circle. Using a ruler, mark three equidistant lines on the back of the circle. Cut along the lines, but don't cut completely through, to create petals. You need to leave some room in the middle so the flower doesn't fall apart. 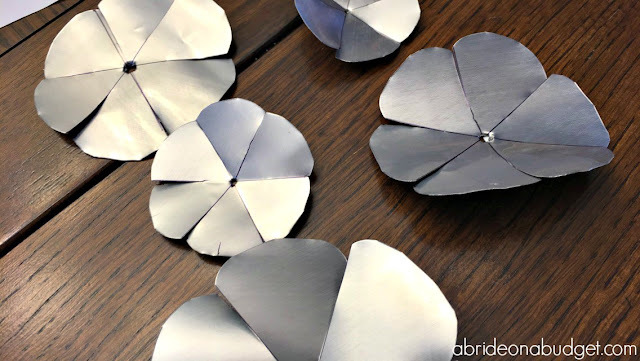 Cut the "corners" of each of the petals to round it. Use a center punch to make a hole in the center of each circle. It's actually pretty easy to find the center because it's where all three lines intersect. Take the pliers and curl each end of the petal and curl it towards the middle of the petal. Do this with the design side of the can up. Put the paper fastener into the two 2.5 inch circles, then then two 3 inch circles, then into the 5 inch circle, and close the fastener. Now, you can play with the flower a little to make it the way you want it. 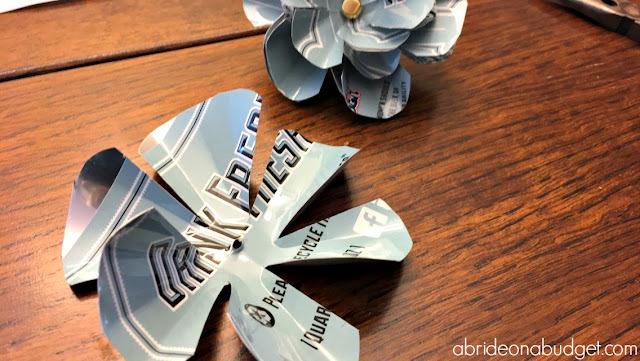 Take your plastic flower and pop the flower portion off, leaving only the stem. 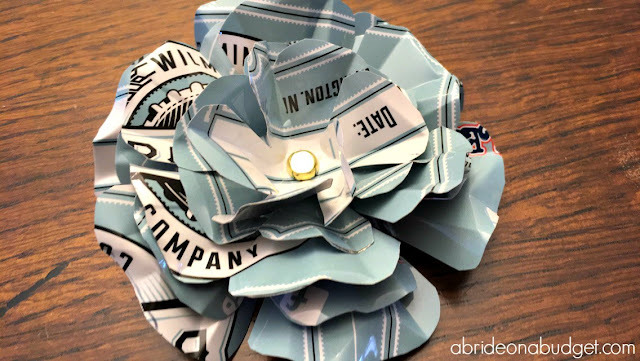 Using a glue gun, glue the beer can flower onto the top of the stem. Let it dry completely. If you want, you can cut the smallest circle into slits, or you can just leave it whole. Either way is pretty. 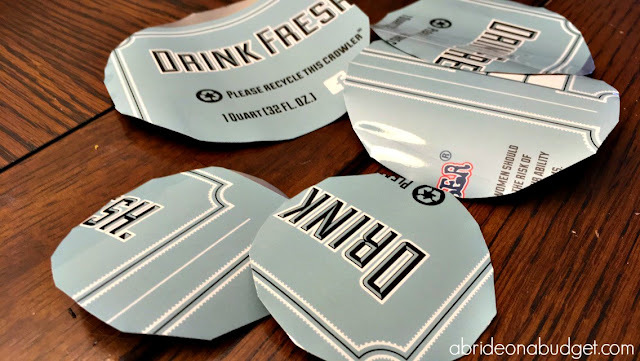 You can display them in a personalized growler or another beer can. BRIDAL BABBLE: Would you make this DIY Beer Can Flower? Incorporating beer into your wedding? 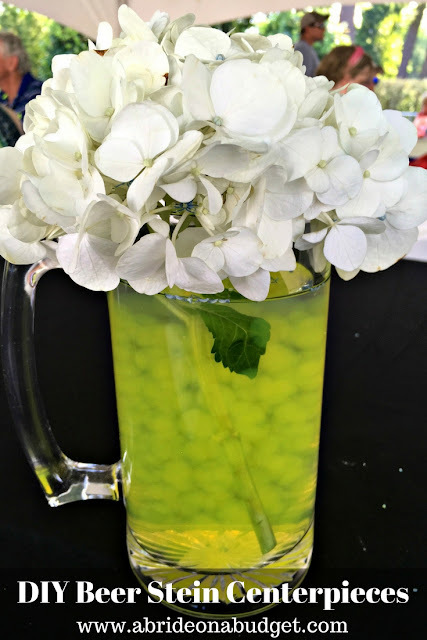 Make our DIY Beer Stein Centerpieces.